He knocked Bill Gates from the coveted spot of â€˜richest man in the worldâ€™ in October 2017 and has held that position ever since. In 2018 alone, his wealth as of June has grown by almost $40 billion dollars. He founded the worldâ€™s largest online retailer, and now wants to make it possible for humans to colonize space. In short, Jeff Bezos is the man. In this book we take a look at the life of Jeff Bezos. From humble beginnings in Albuquerque to present day CEO of Amazon. The book takes a look at the inspirations and influences that make Jeff Bezos the man he is today, and his approach towards life that has ensured the success he is now known for. 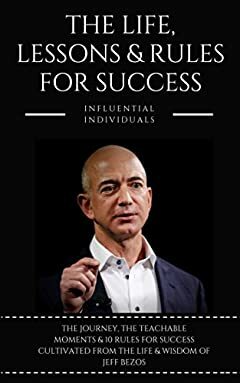 The aim of this book is to not only give you a glimpse into the life of the worldâ€™s richest man, but to also inspire and teach you some of the success principles that have guided Jeff Bezos so far. Ready to learn from the richest man ever? Letâ€™s dive in.